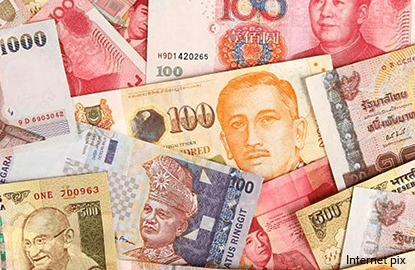 SINGAPORE (Feb 22): Most Asian currencies were steady to firmer on Wednesday, as investors awaited the minutes of the Fed's latest meeting for hints on the timing and pace of possible US interest rate increases. Dollar-selling by local exporters helped give a lift to the South Korean won, which rose 0.4% against the greenback. The Taiwan dollar and a few other Asian currencies including the Indonesian rupiah also inched higher. Analysts said the firm tone of regional equities coupled with the US dollar's pullback from a six-day high set against a basket of major currencies on Tuesday helped lend support to Asian currencies. There was also some focus on the news that US Treasury Secretary Steven Mnuchin had told International Monetary Fund Managing Director Christine Lagarde on Tuesday that he expects the IMF to provide a "frank and candid" analysis of exchange rate policies. "Overall, we see North Asian (currencies) outperforming partly due to the uncertain US trade policy, as no one wants to be in the crosshairs at the current juncture," said Andy Ji, Asia currency strategist for Commonwealth Bank of Australia. The rationale is that South Korean and Taiwanese authorities may be more cautious than usual about conducting dollar-buying currency intervention as that could raise the risk of them being labelled currency manipulators by the United States, Ji said. In late January, US President Donald Trump had accused Japan and China of engaging in devaluing their currencies, while trade adviser Peter Navarro said Germany was using a "grossly undervalued" euro to gain an advantage. That has stirred concerns that the currency policies of Asian economies with large trade surpluses could face increased scrutiny from the United States. In the near-term, Asian currencies could take their cues from the minutes of the Fed's Jan. 31-Feb. 1 policy meeting, due later on Wednesday. The focus will be on the Fed's economic assessment in the minutes, which should emphasise a recent uptick in economic data, although the market may still remain sceptical about the chances of a near-term Fed rate hike, said Christopher Wong, senior FX strategist for May bank. "Markets are likely to second-guess how convinced and cohesive the FOMC members are in terms of raising (interest rates) soon," Wong said. "In our opinion, the March meeting remains a live one," he said, adding that there was a risk that the Fed could catch the market off guard if the market remains complacent about the chances of a near-term rise in US interest rates.